When I first found the Stagen Leadership Academy, I had been putting all of my energy into changing. In fact, I had always thought that changing my leadership style or personality was the best way to take our company to the next level. The truth was, my leadership style worked just fine. That is, it would have been fine if I had been happy with the status quo of a business that ran “just fine.” The company wasn’t seeing the results I knew we had the potential for, and I believed it was because I had to become a stronger leader. For all I knew, maybe I needed to change my personality. My path had led me to this fork, and I had a major decision to make. If my company was to grow, the growth had to start with me. That much I knew. But now I was in a room with a couple dozen high-power executives, leaders, and CEOs, wondering if I belonged here—“here” being my first Stagen Leadership Academy’s Integral Leadership Program (ILP) class. I struggled internally as I compared myself to my ILP classmates whose resumes were far more impressive than my own. As intimidated as I was, I felt it was an amazing opportunity to be in that room, and I was going to participate and learn alongside everyone else to the best of my ability. Eventually, when the shiny masks fell off, when we shared our struggles, I eventually began to see that we all shared similar fears and concerns. I’m naturally a quiet, reserved man, and I felt as though the training I had was sufficient to lead a company the size and scope of Northland as it was … but I knew we weren’t reaching our potential. Northland was the only place where I had ever worked, and although we had implemented a local leadership training at our small company, it was palpable to me that we were missing out on so much growth. While I was searching for a leadership development program that would help us do just that, my long-time friend, Karen Sammon, highly recommended the Stagen program she had recently graduated from. I’ve known Karen for a long time, and I trust her business sense, so I signed up. But once I was there in the room, my shyness and tendency to feel intimidated kicked in. Who was I, President of a small company, to be in this class, a virtual who’s who of entrepreneurial America? Rand Stagen said something that opening night that caught my attention. Much like Morpheus offering Neo the red pill in The Matrix, Rand stood on stage and offered us a challenge: “Once you go down this road, there’s no going back.” I didn’t fully understand what this meant at the time, but I kept coming back to it each month. As I dove deeper into the materials and reviewed our trainings each week, I began to understand it better and better. Now I got that there really was no going back once I woke up to this new matrix of business reality. Challenge accepted. To say the 52-week class was extraordinary would be an understatement. I’d believed that becoming a more assertive, stronger, and impactful leader meant changing who I was. But once I was at Stagen, I quickly realized that this leadership program was actually about allowing me to be myself. I had an image of what a leader was. Like many executives, I’d read about tactics, methods, and techniques. No matter what I tried, they did not fit my personality; when I was trying to be someone else, all those strategies came off as inauthentic. Not surprisingly, every exchange in that vein left me feeling even less inspired to be assertive. For example, prior to the ILP, I didn’t know much about personality types or communication styles. I would feel frustrated and confused when, despite my most diplomatic efforts, I was met with responses that told me I was making it harder for others to communicate with me than it was necessary. Now, after having gone through the ILP, I can say that I welcome difficult conversations as a chance to become more transparent and communicative, whether it’s with a manager, a customer, or my wife. It’s funny to me now, but I had thought being a leader meant never showing weakness. Tools that Stagen gave me, like the Drama Triangle and the Walk the Talk practice, made two things blatantly obvious. One, by hiding my weakness, I wasn’t acting consistently with our company’s values. Two, when I began admitting my weaknesses and blind spots to others, I learned that my employees had known about them all along. But because I was now admitting to my struggles, my team supported me. 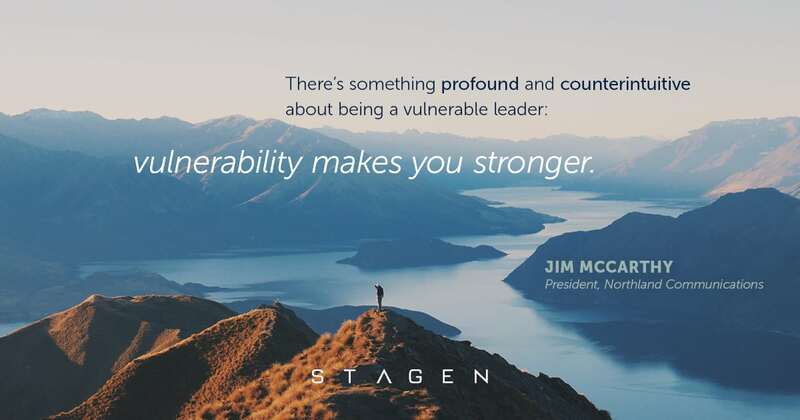 There’s something profound and counterintuitive about being a vulnerable leader: vulnerability makes you stronger. It seems crystal clear to me now. For my entire career, I could not understand why Northland was having some of the issues we did. Lo and behold, me hiding my vulnerabilities had been part of the problem. Both the personal and organizational value I have gained by attending the ILP has been significant. In the few short years since attending that opening night, it’s been exciting for me to see how many people have told me that my transformation has inspired them to step outside their comfort zones and identify where they want to be, how they are going to get there, and how to address their own blind spots. Sharing the materials with my team and teaching them the ILP principles has been awe-inspiring. As I visit many offices within the company, I see reminders like the Drama Triangle hanging on the walls, and I know we’re using the same language. Not that it’s easy. Some days I feel like we take one step forward and two steps back. In the past, I labeled missteps as failures, but now I see them as opportunities to learn and grow. Once I went down this road, there was no going back. I have so much more clarity now, and I have learned that the answers to my problems are oftentimes right in front of me. If anything, I notice it can be harder on this path because with more awareness, I have better visibility to my inconsistencies … and that’s not always easy to process at first. Besides the impact my change has made on my employees, the most unexpected benefit is one I’m seeing in my family. My wife fully embraced the new, better version of me. Like many couples, we have opposite personalities, and that sometimes led to arguments: She’d charge, and I would shut off. Through what I’ve learned about communication, I now know we just have different communication styles. I see the change in my daughters, too. Just a few weeks ago, Maddy blew up about something, and I asked her what she thought drove that behavior. Her answer humbled me. “I was anxious,” she said. That was a joyous moment for me. If I can transmit even a fraction of these principles to both of my daughters over time, I will feel proud. The capacity for high-level emotional access and understanding what’s driving their behavior will position them to be the best versions of themselves right out of the gate, and will hopefully mean that they won’t have to retrain themselves at 45 like I did. For those considering the ILP, I have some advice: just do it. But beyond that cliché, I will offer you this. You’ll get a lot out of the program even if all you do is show up. But if you’re like me and are willing to go deep and really look at yourself, the potential is unbelievable, and the rewards will continue long after commencement. Rand said that once you go down this road, you can never go back. “No going back”: I didn’t really know what it meant at the time, but I do now. Not only can I not go back, but I can’t imagine wanting to.